A negotiation process with the station manager has resulted in two time slots for me to go out with all my /P gear and try to get some new (band) DXCCs during the WPX contest today (afternoon and evening) and tomorrow (morning). Preparing for this I had a little issue to solve: my microphone audio failed during my last day out. I already had had problems before with the connector for the Heil to the FT-857. It is a rather larger connector with thin wire (refer to picture below). Especially the connector for the PTT connection is large and heavy compared to the wire it is connected to. During CQWW last year this resulted in a broken wire inside the PTT line. Remembering how to set the FT-857 to Vox I was able to continue. Now however the audio line also seemed to fail. I fixed that but now also needed a new connector to the FT-857. 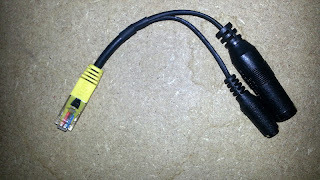 I ordered a replacement for the original connector - just to be safe for the contest - but also contemplated on making a cable myself that would solve another issue: the large RJ45 connector (the yellow one). The RJ45 goes inside the FT-857 behind the detachable front but is in this Heil cable so large that the front of the FT-857 cannot be reattached. This is not a major issue as it can be practical to have a loose front that you can place in a visible position but it would be convenient if I could choose to leave it on. So I made a cable myself with a smaller RJ45 and only the audio connector (vox works perfectly). I made this cable rather short and attached it with tie wraps to the bottom of the FT-857 (see picture). In this way I expect the cable will last longer as there will be almost no strain on it. Today I will put this to the test with the original connector and the original hand microphone as backup.. Active from about 14h local time, for 8 hours with some gaps to (1) discuss my set-up with Wilko PA1WBU who visited me shortly and (2) switch from the hexbeam to the yagi and back soon after (stupid decision as 10m was already closing). In the 5-6 hours radio time - mainly using the hexbeam, I logged 60 calls of which 55 were contest QSOs. In the log are now 9 new DXCCs (3DA, 5Z, D3, DU, FH, FR, KL, RI1ANU and 4U1ITU) on top of that 14 new band DXCCs. Worth mentioning is my second Antarctic station RI1ANU (actually a separate DXCC). I was also thrilled with ZL3 on 20m (new band). Tomorrow morning I will have a look if there are more interesting calls active. I have time until about lunch time. Of course this weekend is one hour shorter so it is off to bed to get some sleep before going out again. BTW, the mic connector worked brilliantly..